Happy Monday Friends! It's officially the 1st Monday in December and I'm so excited! December is my absolute favorite month of the year. I love celebrating the birth of our Lord and Savior Jesus Christ. I love the beautifulness and the peacefulness that the Christmas Season brings. I also love all of the fun activities to do during Christmas time, especially now that I have my son. I always try to make as many fun memories with him as I can for the holidays. 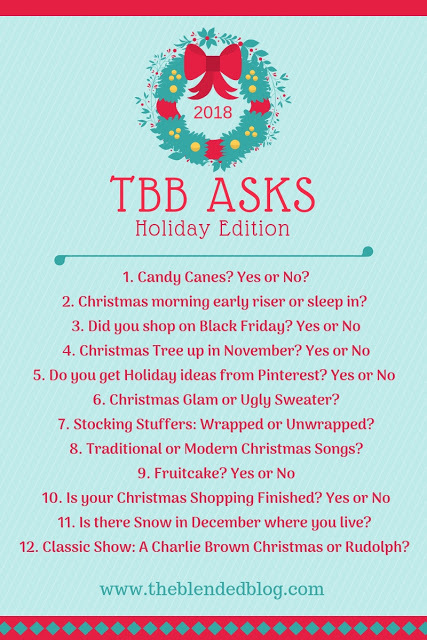 So today, I am really excited to link up with my friends from The Blended Blog to bring you this Holiday Edition of TBB Asks. 1) Candy Canes? Yes, I love anything peppermint. I also love to hang candy canes on our Christmas tree. 2) Christmas morning early riser or sleep in? I love to get up early to enjoy my coffee, read the Christmas story and wait for everyone else to get up so that I can see the look on their faces when they see what is under the tree. 3) Did you shop on Black Friday? Yes, my friend Tif from Bright on a Budget and I always make it a annual tradition. We always have so much fun! 4) Christmas Tree up in November? Of Course! I put ours up around the 1st of November so that I can enjoy it longer. I love looking at the lights and watching Christmas movies. It's just so peaceful. 5) Do you get Holiday ideas from Pinterest? Yes, I love Pinterest! 6) Christmas Glam or Ugly Sweater? Both. I like to wear my Ugly Sweater on Christmas Eve and Dress up on Christmas Day. 7) Stocking Stuffers: Wrapped or Unwrapped? Unwrapped, that's just too much work to wrap all of those. 11) Is there Snow in December where you live? Yes, last year we had snow on Christmas which made it so magical. Thanks for stopping by! Be sure to join in on the fun! I would love to hear from you! Merry Christmas and God Bless You!